I couldn’t have been the only person cringing at some of the commercials during this year’s World Cup on the American English-language broadcasts. Fans wearing jerseys from different nations in the competition presenting their, “Hey, America, sorry you didn’t make it this year, but cheer for us!” pitch. It makes sense that Fox was scrambling to generate excitement for the first World Cup minus the USA since 1986. Don’t get me started on the DNA websites that want to trace your ancestral roots to a footballing country that qualified for the tournament — sites that really only have data if you’re from European descent. For this piece, we’re going to call soccer football, because I’ve been pretentious this World Cup cycle… or I just want to get on level playing ground with the rest of the world. You can’t just write off the USA as a non-football country. Football with feet is consumed differently in the United States. Plenty are ethnocentric and won’t even watch if we aren’t in play. World Cup viewership on Fox decreased 42 percent compared to the 2014 cup in Brazil carried by ESPN/ABC, according to Nielsen Media Research. Excluding games the U.S. played in 2014, the drop was still 28 percent. But flip the channel to Telemundo, where 6.56 million people in the U.S. watched on the first Saturday of the tournament as Mexico pulled an improbable upset over defending champions Germany in the team’s first group game. Culture is a part of the equation, but I’ll just leave that topic alone for now and bank on the fact that if the USMNT is good, viewers will tune in. Chalk it up to the concept of fair-weather fans. Like I said, writing the States off as a country that flat-out doesn’t care about soccer is lazy. Just because padded football and basketball dominate the airwaves for the other three years and 11 months, I think fans still have space for a sport that’s exciting and tactical without the brutal hits, brutality of a trillion commercials at the most tense moments and, of course, a league that has been ruined because of the free-agent market. The United States Women’s National Team takes back seat to no one on the world stage. They’ve won three of the seven Women’s World Cups awarded so far. So soccer players and fans exist coast to coast, no doubt. 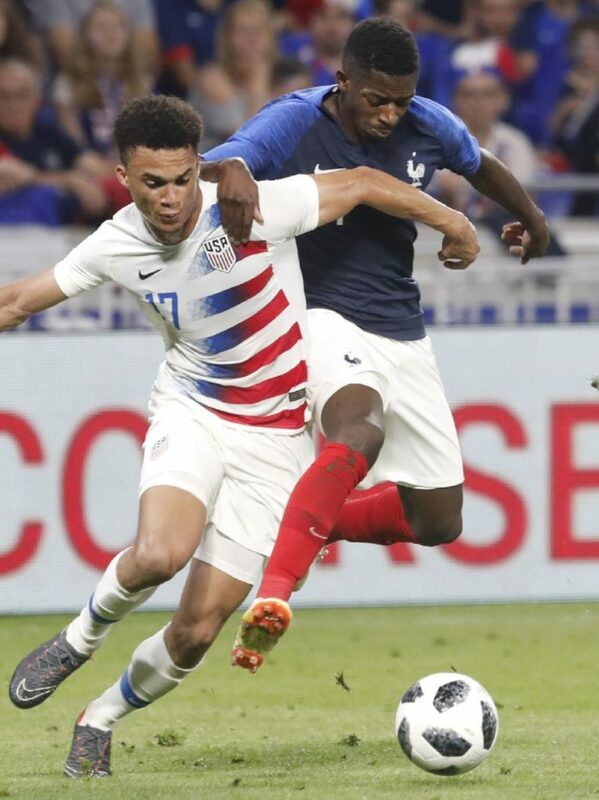 If the U.S. could produce men’s professional soccer players the same way basketball, football and baseball players are fitting into the top leagues sometimes as teenagers and in their early 20s, the team could possibly compete on the World Cup stage. Even if the MLS isn’t viewed on the same level as other leagues in America, Liga MX and the Premier League are watched by the millions in the U.S.. Fans tune in early Saturday and Sunday for British league games and in the afternoon for massively popular broadcasts of Liga MX. Kevin Baxter’s 2016 Los Angeles Times article said the top league in Mexico had 16 percent more viewers than the EPL that year. Mexico obviously had a far better World Cup cycle this time around, but the U.S. has gotten the better of El Tri on important stages in the past. You don’t even need to leave the U.S. to feel the passion Mexican fans have for selección Mexicana. Watching a game here in the Valley sums it all up. Longtime American fans will brag of the “dos a cero” result in the 2002 World Cup round of 16, when the US advanced to the quarterfinals for the first time since the 13-team 1930 tournament. What is U.S. Soccer doing wrong with its program? Mexico did enough to both qualify for the World Cup and play an effective system with a roster that showcased youth and utilized vets on the pitch and in the locker room. For the U.S., disappointment prevailed even through the moment of Landon Donovan scoring in extra time against Algeria in 2010. That tally was just enough to survive the group stage. Moments like that should push the trajectory of the program upward, right? During the USMNT’s second match in 2014, against Portugal, goalkeeper Tim Howard provided a man-of-the-match performance. But a defensive lapse in stoppage time flipped the narrative from a potential 2-1 win to a buzzkill 2-2 draw. In the round of 16, Howard again kept the States in the match, until the team was eventually overpowered by Belgium and the likes of late substitution Romelu Lukaku in extra time. In this World Cup Cycle, leading up to the perfect storm of misfortune on the night of Oct. 10, 2017, in Trinidad and Tobago that ended America’s hopes to play in Russia, the holes in the prospect pool were glaring. Christian Pulisic, the undisputed best current player on the roster, scored most of the team’s goals in qualifying. Jozy Altidore and Bobby Wood, two attacking players who likely won’t figure into the next World Cup, were the only other consistent names on the scoresheet. Consider the words of Hope Solo, the often polarizing former Cup-winning goalie of the Women’s National team, during a conference this year. She said her “family would not have been able to afford to put me in soccer if I was a young kid today” and went on to say discuss the trend of wildly expensive training at the youth level hurting the state of soccer in the country. Sean Gregory wrote in a Time Magazine article dated Aug. 17 that free-to-play sports and the ability to play through college without incurring substantial fees is an increasing rarity. On the high end, families might have to spend up to 10 percent of their income on registration fees, travel, camps and equipment if they want their young athlete to be on equal footing with those who can afford to train. That can’t be the status quo, especially with how difficult it is for many families to make a living with wages at a standstill. Not everyone can make ends meet and put one, God forbid multiple, children in year-round travel sports. What needs to exist for the U.S. to prevent players falling through the cracks is a development system and opportunity for players in underserved areas to show their skills. Instead, those who can pay are the ones in front of America’s top scouts and coaches. With minimal equipment required even compared to sports like baseball and softball, perhaps more soccer programs could be integrated in schools. If a player is talented enough with his feet, that should be his free pass to education, boarding and travel to the best soccer in the country. If the parent gives the OK and the player has the passion, the U.S. Soccer Federation should invest in the youth and see the profit in the form of successful teams, instead of the other way around. So maybe one day a nation like Croatia, with a population closest to a state like Louisiana or Connecticut, will have to worry about the potential of a pacey midfielder from a region like the RGV in the World Cup. Hey, we can dream, right?